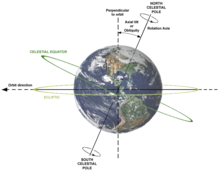 ^ When Earth's eccentricity exceeds 0.047 and perihelion is at an appropriate equinox or solstice, only one period with one peak balances another period that has two peaks. ^ Aoki, the ultimate source of these figures, uses the term "seconds of UT1" instead of "seconds of mean solar time". ^ Sidereal day is arguably a misnomer because the dictionary definition of sidereal is "relating to the stars", thus fostering confusion with the stellar day. ^ In astronomy, unlike geometry, 360° means returning to the same point in some cyclical time scale, either one mean solar day or one sidereal day for rotation on Earth's axis, or one sidereal year or one mean tropical year or even one mean Julian year containing exactly 365.25 days for revolution around the Sun. ^ See Fallexperimente zum Nachweis der Erdrotation（德语：Fallexperimente zum Nachweis der Erdrotation）（German Wikipedia article）. ^ 2.0 2.1 Jean Meeus, Mathematical astronomy morsels (Richmond, Virginia: Willmann-Bell, 1997) 345–6. ^ Aoki, et al., "The new definition of Universal Time", Astronomy and Astrophysics 105 (1982) 359–361. ^ IERS Excess of the duration of the day to 86,400s…since 1623 互联网档案馆的存檔，存档日期2008-10-03. Graph at end. ^ Arthur N. Cox, ed., Allen's Astrophysical Quantities p.244. ^ Michael E. Bakich, The Cambridge planetary handbook, p.50. ^ Sumatran earthquake sped up Earth's rotation, Nature, December 30, 2004. ^ Why do planets rotate?. Ask an Astronomer. （原始内容存档于2007-06-09）. Why is the earth rotating ?